Bedford Blues take to the road on Sunday afternoon as they head to Lady Bay to face Nottingham in the Greene King IPA Championship. The Blues head into the game off the back of a 64-20 victory over London Welsh, but know that Nottingham – who picked up a bonus point win over Moseley last weekend – will be a tough nut to crack as they look to close the gap on the top four teams. 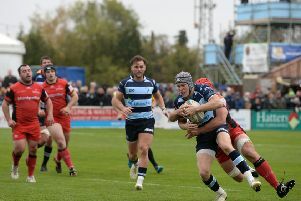 When Nottingham visited Goldington Road earlier in the season, the Blues had to put in an impressive defensive display to secure a 28-19 victory with tries coming from Pat Tapley, Sam Blanchet and Jordan Burns. Bedford head into Sunday’s encounter without Tom Griffiths and Tapley who both picked up foot injuries during the nine try victory over London Welsh. George Perkins is on England U20 duty while Mike Howard is still a couple of weeks away from full fitness. There is good news though, as prop James Currie makes his first start in four months having completed his rehabilitation from an ankle injury.